Grand Central Publishing, 9780446528054, 288pp. When Savannah Lynn Curtis comes into his life, John Tyree knows he is ready to turn over a new leaf. An angry rebel, he had enlisted in the army after high school, not knowing what else to do. Then, during a furlough, he meets the girl of his dreams. Savannah Lynn Curtis is attending college in North Carolina, working for Habitat for Humanity, and totally unprepared for the passionate attraction she feels for John Tyree.The attraction is mutual and quickly grows into the kind of love that leaves Savannah vowing to wait for John while he finishes his tour of duty, and John realizing that he's ready to settle down with the young woman who has captured his heart.Neither can foresee that 9/11 is about to change the world and will force John to risk every hope and dream that he's ever had.Like so many proud men and women, John must choose between love and country. And like all those left behind, Savannah must decide to wait or move on. How do we choose wisely? How can we face loss-without giving up on love? 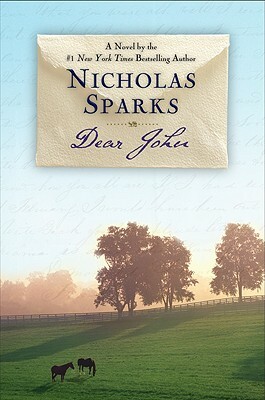 Now, when he finally returns to North Carolina, John will discover that loving Savannah will force him to make the hardest decision of his life. An extraordinary, moving story, DEAR JOHN explores the complexities of love-how it survives time and heartbreak, and how it transforms us forever.